Database architecture can be 2-tier or 3 tier architecture based on how users are connected to the database to get their request done. They can either directly connect to the database or their request is received by intermediary layer, which synthesizes the request and then it sends to database. In 2-tier architecture, application program directly interacts with the database. There will not be any user interface or the user involved with database interaction. Imagine a front end application of School, where we need to display the reports of all the students who are opted for different subjects. In this case, the application will directly interact with the database and retreive all required data. Here no inputs from the user are required. This involves 2-tier architecture of the database. Let us consider another example of two tier architecture. Consider a railway ticket reservation system. How does this work? Imagine a person is reserving the ticket from Delhi to Goa on particular day. At the same time another person in some other place of Delhi is also reserving the ticket to Goa on the same day for the same train. Now there is a requirement for two tickets, but for different persons. What will reservation system do? It takes the request from both of them, and queues the requests entered by each of them. Here the request entered to application layer and request is sent to database layer. Once the request is processed in database, the result is sent back to application layer for the user. Easy to understand as it directly communicates with the database. Requested data can be retrieved very quickly, when there is less number of users. Easy to maintain – When there are multiple requests, it will be handled in a queue and there will not be any chaos. It would be time consuming, when there is huge number of users. All the requests will be queued and handed one after another. Hence it will not respond to multiple users at the same time. This architecture would little cost effective. 3-tier architecture is the most widely used database architecture. It can be viewed as below. 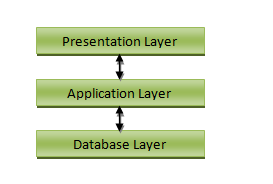 Presentation layer / User layer is the layer where user uses the database. He does not have any knowledge about underlying database. He simply interacts with the database as though he has all data in front of him. You can imagine this layer as a registration form where you will be inputting your details. Did you ever guessed, after pressing ‘submit’ button where the data goes? No right? You just know that your details are saved. This is the presentation layer where all the details from the user are taken, sent to the next layer for processing. Application layer is the underlying program which is responsible for saving the details that you have entered, and retrieving your details to show up in the page. This layer has all the business logics like validation, calculations and manipulations of data, and then sends the requests to database to get the actual data. If this layer sees that the request is invalid, it sends back the message to presentation layer. It will not hit the database layer at all. Data layer or Database layer is the layer where actual database resides. In this layer, all the tables, their mappings and the actual data present. When you save you details from the front end, it will be inserted into the respective tables in the database layer, by using the programs in the application layer. When you want to view your details in the web browser, a request is sent to database layer by application layer. The database layer fires queries and gets the data. These data are then transferred to the browser (presentation layer) by the programs in the application layer. Easy to maintain and modify. Any changes requested will not affect any other data in the database. Application layer will do all the validations. Improved security. Since there is no direct access to the database, data security is increased. There is no fear of mishandling the data. Application layer filters out all the malicious actions. Good performance. Since this architecture cache the data once retrieved, there is no need to hit the database for each request. This reduces the time consumed for multiple requests and hence enables the system to respond at the same time. Disadvantages of 3-tier architecture are that it is little more complex and little more effort is required in terms of hitting the database.